"Does a high corporate tax hurt a country's economic growth and global competitiveness? "The Effect of Corporate Taxes on Investment and Entrepreneurship," a study published last year by the American Economic Association, found a "large adverse impact" from high corporate tax rates on aggregate investment and entrepreneurial activity. In any case, even if the U.S. trimmed its corporate rate a bit more, it still wouldn't be low, relative to other countries'. Japan, whose economy has been stagnant for years, might want to ponder this." 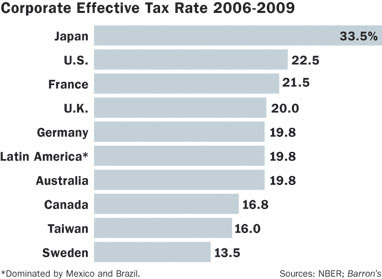 Effective corporate tax rates are levied on declared profits and rules in each country vary dramatically. Therefore, a more intellectually honest way to compare inter-country effective corporate tax rates is the percentage of total corporate revenues paid. The world average is 2.82%. On this basis US effective corporate rates are not out of line, while Japan's rate is the lowest. This blog is much better when you refrain from teabagger fantasies.